Hubby has been raving about this new burger place introduced by one of his friends. Apparently its one of those really good coffeeshop western food outlets, sooo popular that it's jammed packed during weekday lunch hours and sold out within a few hours type. So good ah! So I suggest that he bring me there during our weekend dates. Must try it to believe it right? It's located at a coffeeshop right next to Alexandar Food Centre, and I was surprised that despite it's popularity, it wasn't that crowded. I think they are usually more crowded on weekday lunchtimes. Most of the food stalls at the coffeeshop were closed, but the customers were there for the burger anyway. We had a hard time choosing what to order as everything looked yummy. 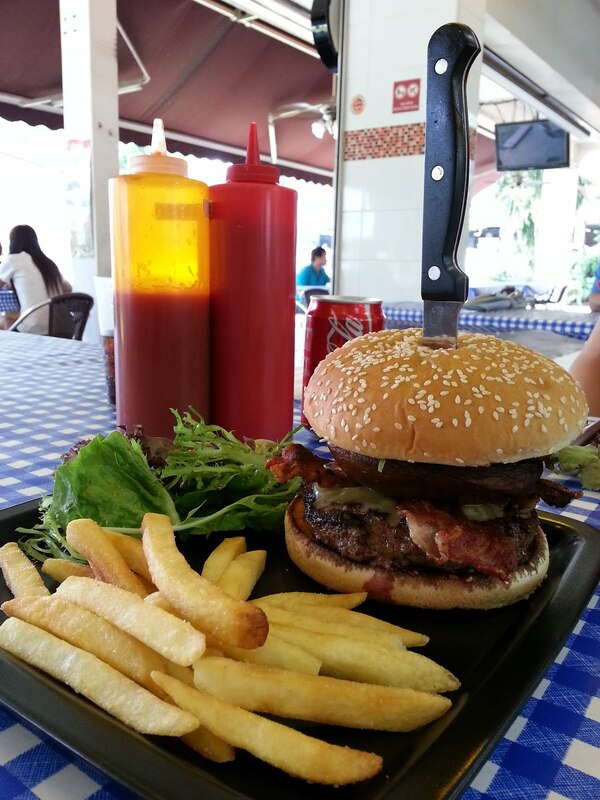 But in the end I chose the Bacon Cheese Burger (S$15.50). 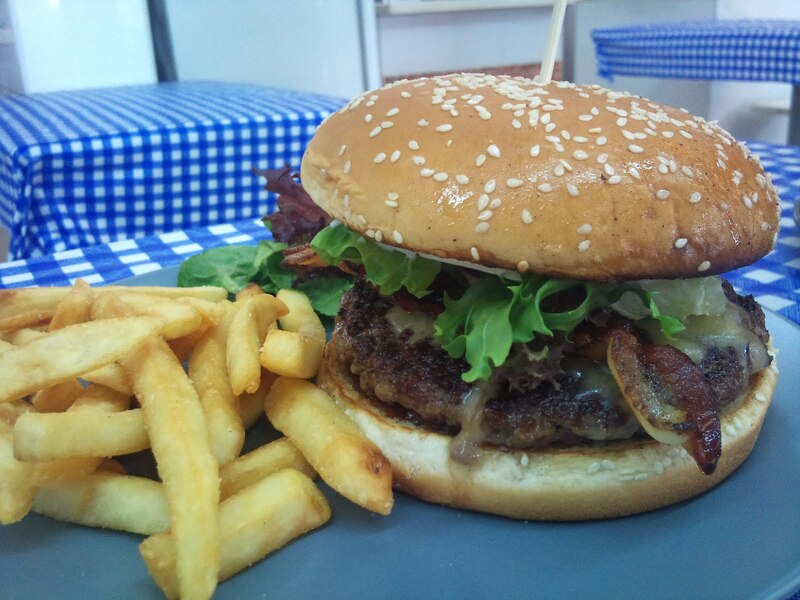 "200g AUS Striploin patty, BBQ sauce, cheese, grilled crispy bacon, salad, tomato, slice onion and mayonnaise"
My bacon cheese burger was better than I expected. The patty was juicy, tender with smoky robust flavours. Puuurfect with the crispy bacon, melted cheese and vege! Hubby had The De Burg, their signature burger (S$18.50). 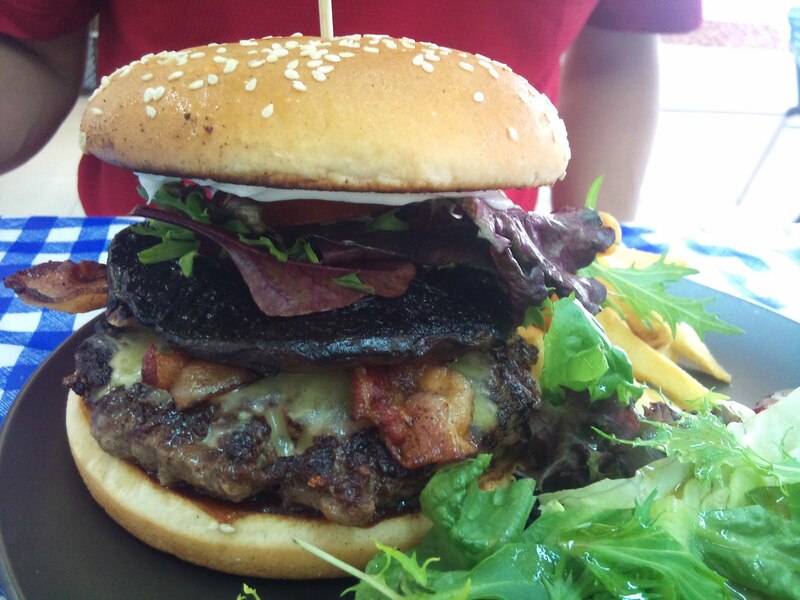 "200g AUS striploin patty, BBQ sauce, cheese, grilled crispy bacon, grilled portobello, salad, tomato slice, onion and mayonnaise." The signature burger goes one step further by adding a thick slice of portobello in it, so every bite was enhanced with the juicy, meaty flavour of the mushroom. Be warned, it could get really messy with the juices dripping all over. So remember to lean forward and get lots of paper towels! We also tried the De Burg Decadence (S$27.90), which was exactly like The De Burg, but meat used was 200g AUS Wagyu beef. Honestly, I could hardly tell the difference. On top of that, my burger was a tad bit too undercooked for my liking. I'm not sure if they undercook it intentionally or they just screwed up. So I would say just stick to The De Burg. It's good enough! Everything was cooked upon order, and with the open kitchen, you can see just ONE poor fella cooking all the orders. Naturally it took awhile to get the food onto your table, but it also meant that everything is fresh and hot from the grill. Even the fries were awesome. Thick, hot and crispy!